I have a new salad recipe for you! Edamame Black Eyed Pea Citrus Salad. Last week my husband and I went to Disney World to celebrate 10 years together. For more vegan ideas at Disney, you can also check out this post. We had dinner at Boma in Animal Kingdom one night. I highly recommend! This healthy salad recipe was inspired by one that we were served there. This salad comes together very quickly and would be great for a party. I think it’s best if you can let it marinate for 30 minutes before serving. That gives it time for the flavors to marinate. If you like my Texas Caviar, I think you should give this a try too! If you don’t want to use edamame, green peas may also work. We filmed a video for this as well. You can view it below. For more videos, you can subscribe to my You Tube Channel. 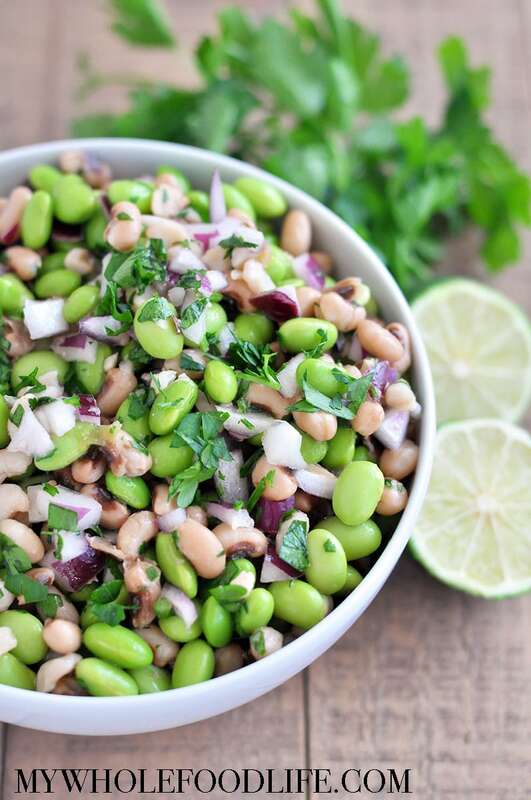 This healthy Edamame Black Eyed Pea Citrus Salad is sure to be a hit at parties. The citrus dressing makes this a winning dish. Vegan and gluten-free. In a large mixing bowl , add all the ingredients. Mix well. Place in the fridge for 30 minutes so the flavors can marinate. This should be stored in the fridge and should last at least 5 days. Enjoy! Thanks Allison! I hope you enjoy it! I'm going to make this tomorrow...Quick question though. When it refers to "Cooked Black-eyed Peas", did you start with the dry beans or did you used canned beans? If it was from the dried beans do you have any tips for a first-timer? Thanks!